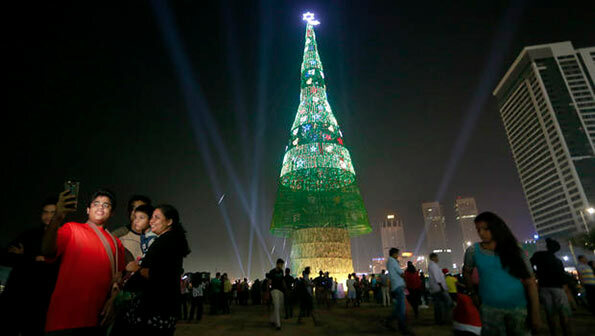 Colombo: Sri Lanka has unveiled a towering Christmas tree, claiming to have surpassed the world record for the tallest artificial Christmas tree. The 73-meter (238-foot) tree, built in capital Colombo, is 18 meters taller than the current record holder, organisers said. The tree’s steel-and-wire frame is covered with a plastic net decorated with natural pine cones, 600,000 LED bulbs and topped by a 6-meter-tall (20-foot) shining star. On Saturday, organisers said their tree beat the existing Guinness record held by a Chinese firm that put up a 55-meter (180-foot) tree-like tower in the city of Guangzhou last year. Sri Lanka’s claim is subject to confirmation from Guinness World Records, which said it has received an application from the organizers and that it is waiting for evidence. So what? Once RW wanted to construct the largest Buddha statue in SL! SL had the largest Tyre Factory (Gift/white elephant from Russia. Another one; Kosgama cheap-board factory one of the biggest in Asia. Rev. Malcolm Ranjith initially opposed to this and gave green light after considering the cost. What is the real objective of this tree? To please Christians in SL? To send a message to the world to showcase religious harmony? Or craftsmanship of Sri Lankans? Beat China and enter into the Guinness book? At least Mahinda Rajapakse built roads, a harbour, an airport, cricket stadium and kept Colombo clean. The tallest X’mas tree, for what? This is going to create unwanted problems, trying to provoke the other religions. kosgama was a plywood factory and chip board factory which was later resold and then there was the steel factory that went through the same fate. These projects were conceptually good but the biggest constraints were the raw materials. Some of the leading industrialised countries continue to import steel to support their industries and the surplus is re-exported (china,Japan). We in SL loves to think big and this Christmas tree is a colosal and the arichitecht Arjun Ranatunga will go down history as the biggest idiot of them all. Oh, the world’s tallest Chrismas tree! What a great achievement for the former SL Cricket Captain of World Cup fame, now unfortunately Yahapalana Minister for the White Elephant Hambantota harbour! The former Prez should be given a number of Guiness Book Records too, one for building the World’s most expensive White Elephants and presiding over the largest number of civilian disappearances in a country!! By the way, a Stupid Australian holds the Guinness Book for Christmas Trees awards for the tree he built in Canberra in 2015. Can believe that, he’s a dumb Australian, just like all others in that country. Well, before MR wanted to construct the world largest Buddha statue, we had the world’s largest or Asia’s largest desiccated milk factory – actually it was built using world bank money – in Ambewela. The problem was there was not enough milk produced in SL even enough to wet the machinery in that factory. Having said that, either MR or anybody else, need to pick something that does not waste public money. He could have built the Asia’s biggest public library including access to electronic media held in other countries, for example. There we go, Indra, MR built another White Elephant in Ambewala without any planning or determining where the raw material for the Milk Powder factory is coming from. I was exactly on the spot when I said MR deserves a Guinness record for creating the World’s biggest White Elephants. In order to build a viable Milk Powder factory, the dairy industry should be developed consistently, over a decade or so and milk production should exceed local demand. When excess milk production is realised, a Milk Powder factory can be built to convert the excess milk to milk powder. The fact is that there is no commission or kickback to be earned in developing the dairy industry. But building a Milk Powder factory brings instantaneous commissions and kickbacks. That is why it was built out of the blues !!! I am very sorry Kalpage, if you do not know the history of Sri Lanka. The Factory I an refereeing to was built during the UNP era in 1960s . Perhaps, you had not even been conceived by your comments. If MR did anything in Ambewela, it must be with the existing factory.